Bear Grylls Ultimate Multi-tool, Nylon Sheath. 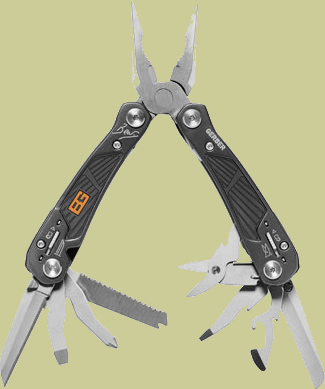 With 12 components, the Gerber Bear Grylls Ultimate Multi Tool model 31-000749 is aptly named. The handle has a texturized rubber overlay that makes the tool comfortable to use and increases the quality of your grip. The components of the tool are external, making them easy to access even without opening the pliers. The 12 components are the tool are needle nose pliers, fine edge knife, medium flathead screwdriver, lanyard ring, serrated knife, bottle opener, saw, can opener, phillips screwdriver, scissors, small flathead screwdriver, and wire cutters. All of the components lock into place and release individually thanks to the Gerber Safe.T.Plus system. The tool comes with a nylon sheath and the pocket guide, Priorities of Survival.